Skin microneedling is also known as Percutaneous Collagen Induction (PCI) or Collagen Induction Therapy (CIT). Microneedling is the term used when the needle length used for PCI is less than 1mm. Medical skin needling is the term used when the needle length used for PCI is greater than 1mm. Home skin microneedling kits have needle lengths of 0.5mm or less. Skin microneedling is used for the treatment of scarring, stretch marks and to improve skin texture. Besides skin microneedling, there are many other procedures that can be used to improve skin texture, stretch marks and scarring. The non-fraxionated, ablative CO2 and ER:YAG lasers, deeper chemical peels and deeper dermabrasion will destroy the epidermis completely in the process of trying to improve skin texture and scarring. Optimally you want to only improve the skin anatomy, not damage certain parts and improve other parts. Perhaps unsurprisingly, the procedures that destroys the epidermis completely, can cause a persistent lightening (hypopigmenation) or darkening (hyperpigmentation) of the skin. Also, the epidermis can become thinner (atrophic) as a result. Scarring, including hypertrophic scarring, has been reported, especially on areas with thinner skin, like the neck. I have therefore eliminated procedures that destroys the epidermis completely from the above list. Superficial chemical peels and superficial dermabrasion does not destroy the epidermis completely, which makes it safer compared to deeper chemical peels and deeper dermabrasion , but is also much less effective and are therefore also left out of the list. The following treatment options remain. Intense pulsed light is a fantastic treatment for pigmentation and blood vessels, but skin microneedling, for example, has at least a 2 times greater stimulating effect on collagen production. [Kim et al. Greater Collagen Deposition with the Microneedle Therapy System Than with Intense Pulsed Light. Dermatol Surg 2011;37:336–341]. Medical microneedling combined with Platelet Rich Plasma, the so-called Vampire Facial or Vampire Peel, has a 10-30% greater collagen stimulating effect than without Platelet Rich Plasma. When if comes to the safety of these treatments fraxionated CO2, Erbium:YAG, Fraxel and skin microneedling devices all injure the skin in a controlled, pixellated way, by puncturing tiny holes through the epidermis into the dermis. Only a small percentage of the total surface area of the epidermis is affected. Lasers punctures the skin with columns of light that heats water in the epidermis and dermis. Skin microneedling punctures the skin mechanically with tiny needles. The lasers involve heat, whereas needling does not. The greater the heat, the higher the risk of a thermal injury that can lead to pigment abnormalities and scarring. The advantage here goes to medical microneedling. The lasers involve heat, whereas microneedling does not. The greater the heat, the higher the risk of a thermal injury that can lead to pigment abnormalities and scarring. Kabir et al. 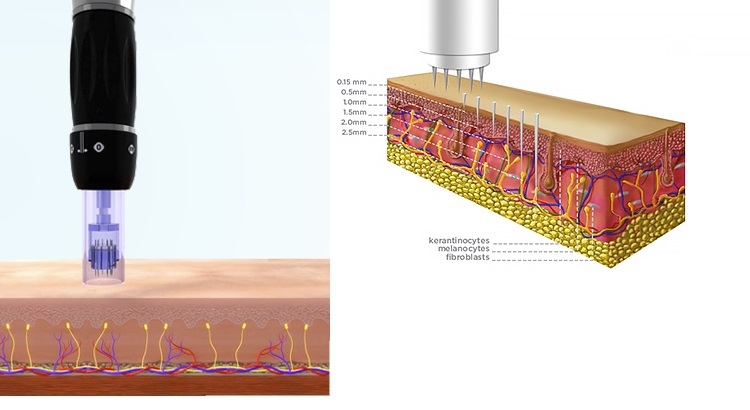 Histological Validity and Clinical Evidence for Use of Fractional Lasers for Acne Scars. Cutan Aesthet Surg 2012 Apr-Jun; 5(2): 75-90. Medical skin microneedling devices can therefore penetrate deeper, but it is unclear how much the depth of penetration actually matters for the improvement of scarring and the induction of new collagen formation. To date (March 2014), there are no definitive double blind studies comparing the beneficial effect of different lasers to microneedling on different types of scarring and skin texture. To get an idea of relative efficacy we therefore have to look at papers reporting on the effect of an individual treatment on scarring and skin texture and then try to compare these papers as best we can. “Patients who opt for fractional laser resurfacing with a nonablative FP laser (Fraxel) will experience: erythema for between 1 and 3 days which should resolve within 1 week; less likelihood of developing PIH, and if it does occur, it should resolve within 1 week; scar improvement of 26–50%; and a relatively comfortable procedure”. There are no papers involving large numbers of patient on the treatment of acne scarring with skin microneedling. Looking at the individual published papers [Leheta T et al. Percutaneous Collagen Induction Versus Full-Concentration Trichloroacetic Acid in the Treatment of Atrophic Acne Scars. Dermatol Surg 2011;37:207–216] on the treatment of acne scarring with skin microneedling, improvement for rolling scars is in the range of 30-80%. It is therefore not possible to draw a definitive conclusion from the lasers studies vs the microneedling studies. It seems safe to say that both fractionated lasers and microneedling works very well for acne scars, but the fractionated lasers might be slightly better for box car type scars and skin microneedling might be slightly better for rolling acne scars. There is in my estimation no clearly demonstrated advantage for either the fractionated lasers or skin microneedling in the treatment of acne scarring and by extension skin texture. Furthermore, additional treatments will result in further improvement with both fractionated lasers and skin needling. This raises the possibility that with enough treatments both the lasers and microneedling will eventually reach the same level of improvement, even if there is a difference in efficacy with individual treatments. Medical skin microneedling requires topical anesthetic ointment for pain relief during the procedure. Fraxionated Erbium-glass (Fraxel) laser requires topical anesthetic ointment with or without oral analgesics and sedatives. There are multiple pain relief options for fraxionated CO2 and Erbium:YAG lasers. Option 1 is topical anesthetic ointment, plus oral analgesics, plus oral sedatives, plus multiple local anesthetic injections; options 2 is conscious sedation and option 3 is general anesthetic. Until the definitive comparative studies are done I think similar efficacy, decreased cost, increased safety and less downtime makes medical microneedling with Platelet Rich Plasma the treatment of choice for scarring, stretch marks and to improve skin texture. The cost of treatment depends on the size of the area that requires treatment, but for a whole face with PRP, which is essential, the cost is R2000.